The Presidential sets, like all other Cabots, are the collective work of a team of over 70 of America’s finest journeymen toolmakers, engineers, and master craftsmen. Cabot’s Jones Deluxe pistols are hand polished – no buffing wheels – for days under a microscope using stones, rubbing, and diamond compounds so that the flats are exactly flat with no broken edges and the rounds are truly round. The hand polishing is completed to a 2 micron finish, which is like a mirror. 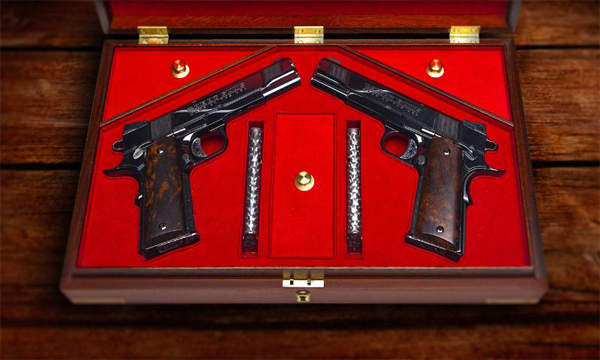 So the mirror image pistol sets also have a mirror image finish. Looking into the side of the slide reveals a true reflection without the fun house mirror effect. 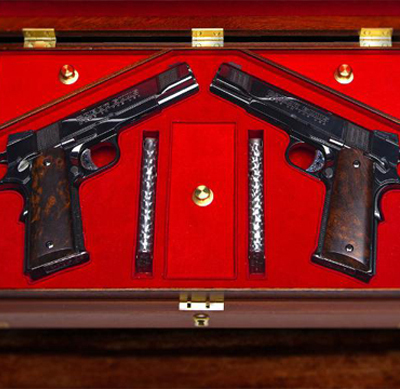 The guns are finished in a double bluing to match the prized black mirror finish.